How it Works: Full Spectrum Infrared are invisible wavelengths of therapeutic light, experienced as heat, that safely permeate the body to raise core body temperature. 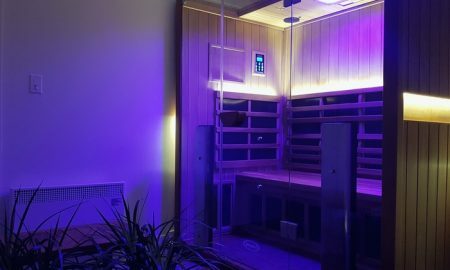 Unlike traditional saunas, which solely heat the air around you and operate in excess of 200°F, Infrared heat warms the body within you and is effective at a more comfortable temperature, between 100°-145°F, producing a deep sweat. Far Infrared (FIR) wavelengths boost your cardiovascular, lymphatic and immune systems creating a deep tissue detox sweat. Mid Infrared (MIR) wavelengths specifically penetrate your body’s soft tissue helping to increase circulation, so more oxygen can reach injured areas of your body. This, in turn, reduces inflammation, alleviates pain and speeds the healing process. Near Infrared (NIR), targets the epidermis and dermis layers of the skin, making your skin look radiant by stimulating collagen production, and improving your skin tone and elasticity. Regular use may help reduce wrinkles, acne and cellulite trapped beneath the skin. Weight Loss: Studies have shown that an Infrared sauna session can burn up to 600 calories. Regular Infrared therapy has also been beneficial in reducing belly fat in just three months. The Experience: A standard treatment session is 40 minutes within your own private cabin suite, and each of the Full Spectrum wavelengths – Far, Mid and Near – is set at 100% for whole body health. Full Spectrum Infrared Sauna is only available at Marda Loop location. Promotional value expires 90 days after purchase. Amount paid never expires. Full Spectrum Infrared Sauna is only available at Marda Loop location. Appointment required. Limit 1 per person, may buy 10 additional as gift(s). Merchant is solely responsible to purchasers for the care and quality of the advertised goods and services.